Recently, I became aware of two magazines from Christian girls. Sparkle targets readership in the grades K-4, and Shine Brightly is geared towards upper elementary grades, so 5-8. This post is a review of the sample copies I received from Gems Girls’ Clubs, the owner of these two publications. Sparkle is published monthly October through March, so six issues total per year, for an annual subscription price of $10.70. It is a 16-page, full-color magazine, mostly glossy. The articles are very interactive and they have Bible references so that you may turn it into a Bible lesson. As such, it could be a supplement to your Bible curriculum. There are nature articles with nonfiction facts presented in a sweet and short way, with a quick show-what-you-know exercise at the end. For instance, your daughter must choose a habitat for a white-tailed deer, beaver, skunk and woodpecker based on the pictures and on the letters which identify each area. There are articles which help them apply the Bible story to their own life. For instance, in the story of Esther, we learn about refugees and how we today can get involved in helping out contemporary refugees by praying that wars may cease, by writing to government leaders, by raising money for organizations that help refugees or simply by helping the homeless in our cities. As such, I see this magazine as a supplement to your social studies curriculum. There are pages for art projects, drawing, tracing, etc. There are also scavenger hunts – even a sound scavenger hunt. Don’t you feel like in our internet age have lost touch with our own senses? This magazine offers two pages worth of information on how to train our ears to listen. Yes, to actually listen to the sounds around us. I find this very useful training. It may even save somebody’s life someday because you have trained your daughter to be aware of her surroundings by listening to all the sounds around her. Even if your little daughter is still learning to read, you could read to her and thus spend some wonderful mother-daughter time together. I find that my daughter wants me to read to her even though she could do all this by herself. 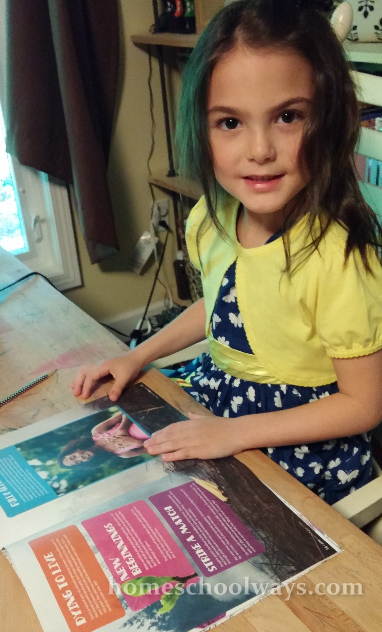 She loved the magazine and asked to work through another one as soon as we finished the first one. Shine Brightly is a 28-page full color magazine for upper elementary female students. Some of the pages are glossy. The stories are longer, the tone is more mature than Sparkle. Expect great articles on helping girls shape a healthy self-image, one which puts physical appearance in its right place, meaning AFTER character and inner beauty. As a mother of a small daughter who is already looking for color, glitter, sparkling jewelry and all the feminine accessories you can imagine, I need guidance how to approach these subjects. We don’t want to raise girls who have forgotten to be feminine and take care of their appearance, but we want to emphasize inner beauty, moral values, and their tremendous self-worth in Christ. This magazine can help a mom guide her middle school daughter through many of the questions of this age. Also discussed in these articles are money matters, thorny social situations, fire safety, real women and what they are famous for, mysteries, community involvement etc. Both magazines are published by Gems Girls’ Clubs, a member of the Evangelical Press Association, among others. So expect the content to have a biblical worldview and to openly teach about lifestyle from a Christian perspective at large. For doctrine points specific to your denomination, you will have to discern and make edits accordingly.